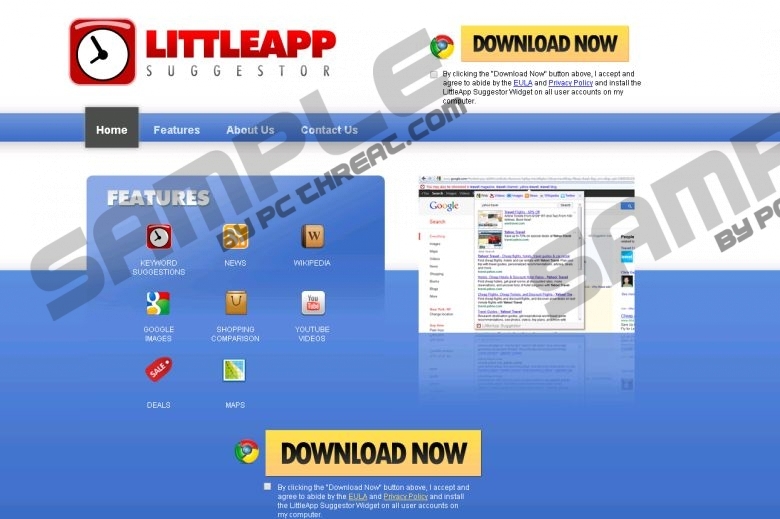 LittleApp Suggestor is a questionable program, which has been dubbed as a potentially unwanted program mostly due to its suspicious functionality. Even though, it might be advertised as an excellent tool that should help with your online searches it does not do that all that well. These statements are used to lure naïve Internet users into downloading and installing an application, which is questionable, to say the least. If you located LittleApp Suggestor active on your operating system, we strongly advise you to remove it as it is not that beneficial. We provide further information about LittleApp Suggestor along with a detailed removal guide, which will help you delete this questionable application in an easy way. Even though it is possible to download LittleApp Suggestor from its official website, we have discovered that in most cases this potentially unwanted program is distributed via software bundles. This is one of the main reasons this application was dubbed as a potentially unwanted program. If you wish to avoid LittleApp Suggestor you should avoid various third-party download websites as bundled installers are often hosted on them. Also, you should always choose advanced installation method as it provides maximum information about the setup processes. This way you might be able to cancel the installation of any additional software. Lastly but most importantly every user should have a reliable antimalware tool active on their PC at all times as it would warn you about any suspicious installers or websites. LittleApp Suggestor functions in a questionable way to say the least. As soon as it enters your operating system your web browser will start to function in a dubious way. You might be provided with various suggestions regarding your searches, and some of them could turn out to be quite helpful. But it has been noticed during the research that some suggestions are utterly useless. What is even worse is that it has been discovered that LittleApp Suggestor could act as an adware program by providing you with various third-party ads and annoying pop-ups. Even though this instance is not that often, it is still a frustrating one. If you wish to regain the standard functionality of your web browser, you must completely remove LittleApp Suggestor from your PC. Complete removal of LittleApp Suggestor is crucial as just a few leftover files or registry entries could be used to silently restore this questionable program. It is important not to skip any steps and to conduct a thorough analysis of your PC for potential leftovers as soon as you have executed the manual removal. You are also advised to scan your PC with a professional antimalware tool as well as it is your best bet to be sure that LittleApp Suggestor was removed entirely. Select LittleApp Suggestor and then click Uninstall. Right-click LittleApp Suggestor and then select Remove. Confirm that you want to remove this application. Quick & tested solution for LittleApp Suggestor removal.